This article is written in honor of the life and legacy of Cesar E. Chavez. “What is the light for?” asked my son Joaquin on a drive home from piano class. A large spotlight flooded rows of strawberries providing light for a tractor driver spraying pesticides. The driver wore the required protective suit that covered every inch of his body, his nose and mouth covered with a surgical mask. The night gave the typical sight an eerie quality. The light illuminated the thick chemical mist as it rose up from the ground like steam. “Shouldn’t he be wearing a gas mask?” asked Joaquin. Protective gear is essential when dealing with contagious viruses, or radioactive cleanups, but shouldn’t be a necessity on the farms that grow the food we eat. My proximity to conventional cropland in part influenced the decision to institute an “organic when available” family policy. In 2011, 144 million gallons of chemical pesticides were sprayed onto cropland in the U.S. Pesticides are applied as droplets, each droplet lighter than dust. The mist scatters and drifts and settles on surface water and leaches into water tables. The USGS tested 1,412 shallow wells in agricultural areas and found the presence of one or more pesticides products in 60 percent. The same study found nitrate in all the wells, with 21 percent at or higher than the U.S. Environmental Protection Agency’s (EPA) Maximum Contaminant Level. It is impossible to elude exposure of chemicals. We breathe them, drink, eat and roll in the grass treated with them. Each of our bodies holds at least 700 chemical contaminants, according to EPA estimates. 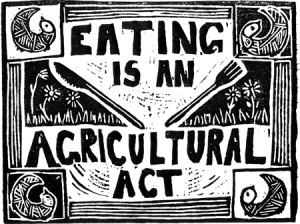 Farmworkers and farmers working on the 1.3 million farms have amongst the most intimate and chronic exposure. It is why Cesar E. Chavez fasted for 36 days in the summer of 1988. He understood chemicals to cause birth defects and cancer among farmworker children. It was his last fast. Our food system is chemically dependent. The price is paid, by our water, our soil and our health. Click here for information on the award winning documentary Cesar’s Last Fast, available to view on iTunes.